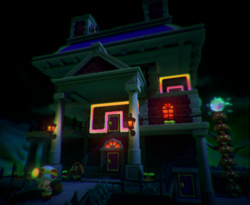 Bizarre Doors of Boo Mansion (known as Dodgy Doors at Boo Mansion in the British English version) is the 16th course of Episode 1 in Captain Toad: Treasure Tracker. This level takes place at a Ghost House. Captain Toad starts at the front path and must dodge a Goomba to enter the house. He promptly exits to the left of the mansion. After getting over a fence by moving Touchstones and doors in a puzzle, Toad must sneak around the mansion, avoiding a Boo and a Goomba Tower that has a Super Gem on top. After getting on the roof via a door, two Big Boos make a last attempt to stop Captain Toad, but they can easily be dodged using either the nearby door or using Captain Toad's headlamp to defeat them. Super Gem 1: In a plant to the right of the entrance. Super Gem 2: On a platform involved in the doorway puzzle to the left of the mansion. Super Gem 3: Atop a Goomba Tower near the end of the level. Cleared course in only 4 touches! Toad never actually goes inside the Mansion, unless the doors are counted, though they act more like portals. If the player wait for 5 minutes (300 seconds) at the stage, a lot of creepy handprints will appear suddenly on the backside's wall of the Ghost Mansion. Each of these handprints' position is random every time it appears.